Decades of research show that cognitive function and long-term brain vitality are best supported by ongoing and robust engagement across physical, intellectual, and socio-economic aspects of well-being. The TBH Toolkits are founded on a blueprint of body, mind and spirit engagement for Total Brain Health. The TBH Toolkits are backed by research from studies such as the FINGER study and ACTIVE Trial that have shown the significant benefit of cognitive training across multiple modes of intervention for older adults. 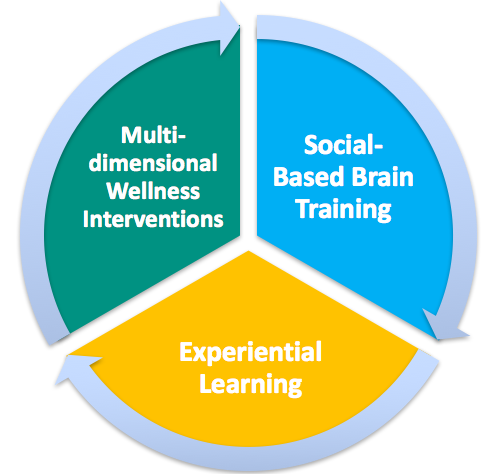 TRAINING ACROSS THE WELLNESS SPECTRUM. Science shows that we must engage in activities across the multiple areas of health to fully boost our daily thinking and long-term brain vitality. BODY. Keeping physically fit helps sharpen intellectual performance, and has been linked to lowered dementia risk. MIND. Cognitive training can revive skills that diminish with age, such as attention, quick thinking, multi-tasking, short-term memory, and reasoning. Research suggests some of these benefits may even last up to ten years. SOCIAL-BASED BRAIN TRAINING. Training in groups has been shown to fast track the effects of brain training on our cognitive abilities and can directly impact the cognitive skills most challenged by aging. All our TBH courses and programs are built on a proprietary method that holds social-based brain training as a core tenet. EXPERIENTIAL LEARNING. We learn better by “doing,” especially the types of activities that have been shown to boost brain fitness. In a TBH course or program you will always find a “hands on” opportunity to try what you are learning, not just read about it or listen to a lecture.